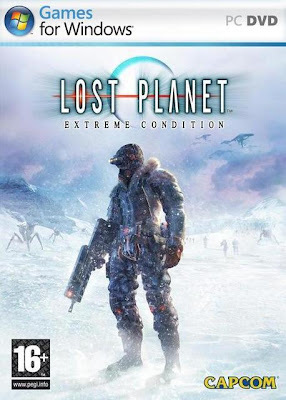 Info: Earlier this year Capcom scored a hit with the release of Lost Planet: Extreme Condition on the Xbox 360. Looking to expand on that success, Capcom is now bringing the game to the PC. The PC version of Lost Planet is a direct port of the Xbox 360 version with new multiplayer maps and optimized graphics and special effects. We played the game to see how it holds up on the PC. In terms of content, you won't find anything new in the Lost Planet single-player game. The multiplayer game is mostly unchanged as well and still supports up to 16 players online with four different game modes. The PC version of the game does come with some new maps and an updated server lobby, but that's the extent of the new content. Lost Planet is branded as a Games for Windows product, but it isn't a part of the Games for Windows - Live program. That means there won't be any achievements or cross-platform multiplayer built into the game. Instead of having new missions, enemies, or weapons, the PC version of Lost Planet has been enhanced and adapted for high-end gaming machines. The game supports both DirectX9 and DirectX10, so it's compatible with both Windows XP and Vista. Most notably, Lost Planet supports resolutions up to 2560x1600, so if you have a capable video card and monitor you can expect to see crisp, detailed effects on the PC that aren't possible on the Xbox 360. Lighting, shadows, and particle effects all show fairly significant improvement over the Xbox 360 version of the game, which already looked great to begin with. The team at Capcom has been working with graphics gurus at Nvidia to optimize Lost Planet for the PC. As a result, Lost Planet is part of Nvidia's "The Way It's Meant To Be Played" lineup of games. ola friend, would like to know, if you know some tool that extracts the texts of the archives .msg of the games lost planet. ?